In former centuries parents chose spouses and professions for their children. Today’s men and women can select their own. Chances are that another person will make at least half the decision for you when you select a spouse. In deciding upon a profession, as at few times in your life, you can stand alone. This brochure is designed to help you decide whether you want to make college history teaching a career. Do you have “what it takes”? Is this the “route you want to go”? What follows will help you answer these questions. It will also call your attention to financial aid that is available for graduate study, and make suggestions about selecting a university for graduate study. The decision is your own. 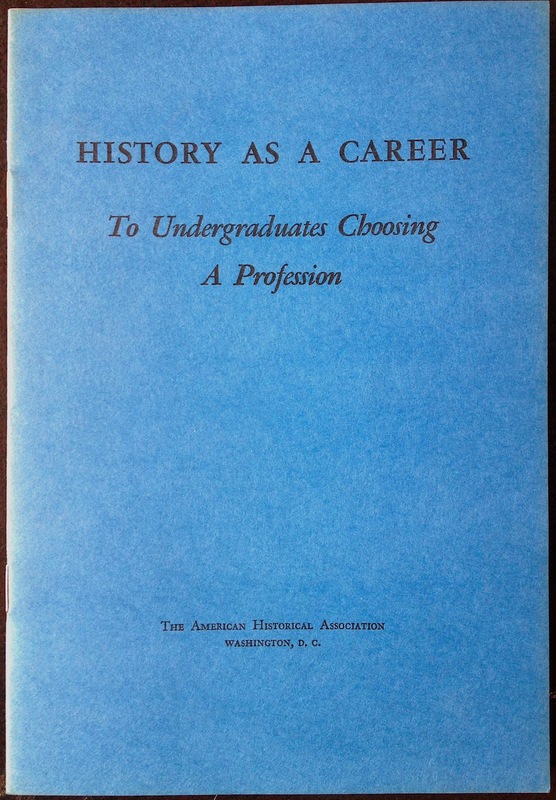 The AHA pamphlet encouraging undergraduates to study history. 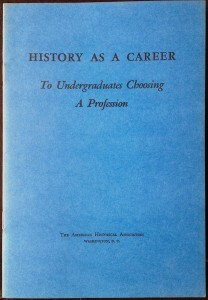 In 1959 “about 330 doctorates in history were awarded” (a few years later there were nearly 600 PhDs awarded, according to Figure 1 in this post) from about 85 universities in the U.S. Half studied U.S. history, a quarter modern European. Those 1960-61 salaries turn out to be $39,900 to 49,100 for new hires and $99,800 for full professors. According to a survey of Average Salaries of Tenured & Tenure Track Faculty in The Chronicle , today’s new assistant faculty earn marginally more at $55,000. Salaries for full professors at research universities, by contrast, have remained flat at $99,800. History salaries do not seem to have kept pace with the national average, which in 1961 was $4007 and in 2011 was 42,979—a 10.72 fold increase. Assistant professors have enjoyed an increase between 8.6 and 10.57 fold. Full professors have suffered worse at only a 7.7 fold increase. I am confident the numbers would look even worse if compared to people with some form of graduate degree (but I don’t have the energy to go find those numbers). It is a bit unsettling to see how little history as a profession has changed over the last 50 years.